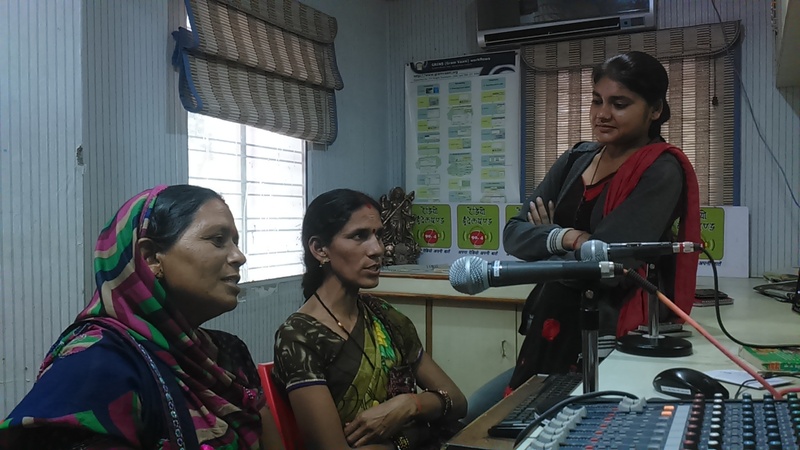 India’s community radio sector boasts of nearly 200 community radio stations. Most of these serve vibrant communities and help them emerge from the shadows of the digital divide. These community radio stations are also the source of important information for these communities. Much of the information that these radio stations share has far-reaching value – whether in the shape of providing life-saving information to mothers on infant care, or informing farmers about how to deal with an impending drought – just to give two examples. Hand-in-hand, the community radio stations serve an invaluable purpose airing their cultural histories. Development Alternatives’ Community Radio Station – Radio Bundelkhand has been the expression of a vision to empower communities by facilitating them access to a dedicated spectrum and, together with studio and machinery, providing them with an important medium to air their cultural aspirations, with messages on their social and economic development riding the crests and troughs of the radio waves. As a result, Radio Bundelkhand boasts an impressive archive of Bundeli folk songs, just as it has made exemplary interventions in the climate change discourse. The list is a long one. All this has been possible because the radio station practices an open-door policy, allowing the locals to access the studio and sit down to make and broadcast their own programmes, in their own voice! Radio Bundelkhand caters to the needs of the local community, giving a voice to the voiceless by creating and broadcasting programmes of local interest while simultaneously addressing their problems through infotainment. The radio station looks at enabling and empowering communities, especially women, young people and marginalised groups, so that they take charge of their own lives as the radio programmes air solutions for fulfilling basic needs like clean water, housing, energy and agriculture and non-farm livelihoods. World Radio Day this year is themed around the slogan ‘Radio and You’ – how each citizen can be part of the radio broadcast. The more people participate in the working of the radio stations around them, the better it runs. ‘Radio and You’ also means that radio listeners are both the lubricants of the radio stations and the owners of the signals the radio station transmits. This echoes the much-feted definition of community radio stations – ‘one that is operated in the community, for the community and by the community’. ‘Radio and You’ is also about the commons. The spectrum is a common, just like the oceans, the forests and the air we breathe. The theme signifies both – the commons that radio, particularly community radio thrives in as well as the spirit of the spectrum over which the message is transmitted as a common for public good. Running community radio stations have been possible as many stalwarts across the globe have fought for the broadcasting rights of communities. In India, this has been suitably bolstered by a Supreme Court judgement in 1995 mandating that the spectrum is public property. Civil society’s struggles for the spectrum though, have invariably met with resistance – like a shrinking spectrum space as the community radio sector in India is today left with just three spectrum bands today – down from six distinct spectrums allocated to community radio stations initially. Now, that space is set to shrink further as the government wants to promote government departments to run their own community radio stations. There is consternation in the community over this – why should government departments that have access to the public broadcaster, have access to a spectrum, many are asking. Community radio stations are radio stations of the community and as the definition in the foregoing paragraphs is any indication, a government department’s community radio station is somewhat of an oxymoron – that is a self-defeating meaning. Naturally so, civil society groups and organisations operating the country’s community radio sector are wary of the government’s apparent interest in roping in government bodies to increase the community radio station footprint across the country. The allowance to government departments to apply for spectrum and radio transmission licence raises an important question – in such cases, can a community radio station retain its original non-state, non-market identity? Practitioners point out that community radio stations were brought in as a third tier of radio, away from the interference of the state and least influenced by market forces. The two were dictating the nature of the content the radio station broadcast in the government-run radio stations and in the commercial radio. Community radio, on the other hand held hopes of offering a fresh change from that trend. The hope was held also because the content broadcast by community radio stations is any time better suited to the communities, coming as it does, in their very own dialect. This has also been borne out by a recent study commissioned by the Ministry of Information and Broadcasting that gives a healthy rating to community radio stations operated by civil society organisations. An in-depth research of the existing community radio stations located across the country in terms of their listenership, reach and effectiveness, was undertaken by a government-appointed agency in 2016. The results of the study points to how community radio stations run by non-government agencies have better listenership because they have been successful in connecting with the community. The study report goes on to say that a ‘majority of the listeners (63%), who were interviewed were listening to the community radio station on a daily basis.” Two NGO operated community radio stations, Radio Sharda and Radio Rimjhim reported a listenership of over 94%. These findings will put the other forms of radio broadcasting in the country to shame, especially because the findings of the study are not very charitable to the performance of community radio stations operated by the government institutions. Apna Radio, the community radio station operated by the Indian Institute of Mass Communication, a premier communication institute of the Government of India and part of the Ministry of Information and Broadcasting is placed at the bottom of the list. Viewed in the backdrop of the ‘Radio and You’ slogan this World Radio Day, the comments in this finding by the government appointed agency make profound sense. It also leads to the questions that, if civil society operated community radio stations are indeed doing well, why should the space for these forms of media ownership be reduced. Read about Bundelkhand Radio Station started by Development Alternatives in the article on ‘Radio, lifeline of common man‘ featured in Times of India Jhansi edition, dated 5th February, 2017.